Learn how to run, jump and play with your dog in one of our five-week Agility classes. Dog Agility is a competitive sport in which a handler directs a dog through an obstacle course in a race for both accuracy and time. 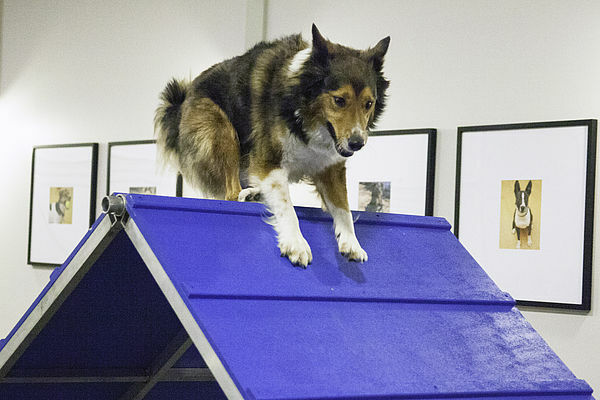 Agility is a fun way to exercise your dog while building a working relationship. Dogs learn to navigate tunnels, A-frames, weave poles, jumps and more while working off leash with their handler. Our classes are designed to teach the dog and handler to run a different course each week. Agility will have your dog jumping for joy and working with purpose. Introduction to Agility obstacles and short sequences. Completion of Beginner’s Agility or consent of instructor is required. Completion of Agility 2 or consent of instructor is required. b. (optional) A short TAB leash as you start to work with your dog off leash. Collar: Buckle collar. Head halters and front clasping harnesses can be used on the way to class but will pull the dog sideways during training and will need to be removed. Treat carrier: A bag, pouch, fanny pack, apron with pocket or deep pocket that provides easy access to treats. This carrier should be secured to your body on a belt or clip so your hands can be free. Treats: Lots of small, easy-to-chew, high-value treats. Cut up pieces of cheese, hot dogs, liver or meat bits are safe bets. Bring lots of them. Your job is to motivate your dog with his favorite things. Wear comfortable clothing and nonskid shoes such as gym shoes. You will be running and bending over during class. Flip flops, sandals and heels are not recommended. Do not feed your dog before class. A slightly hungry dog is more motivated to learn. Plus, it’s best not to ask your dog to run or jump with a full stomach.